Why is Nara Lokesh, and not Chandrababu, Modi's target? On Sunday, Nara Lokesh 'earned' a rare distinction. 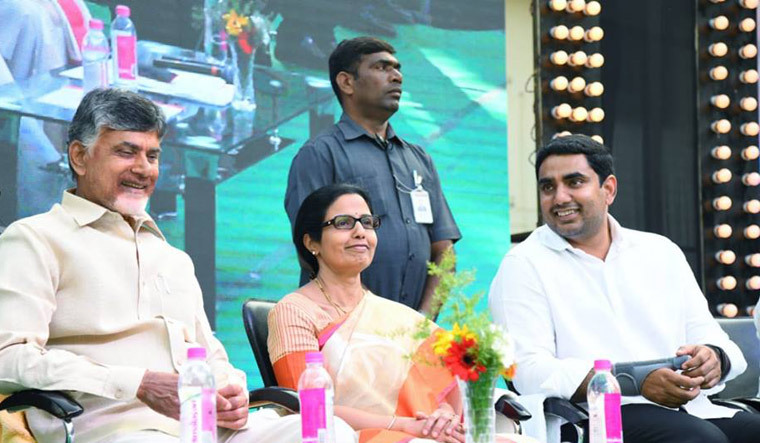 The name of the IT minister of Andhra Pradesh and son of Chief Minister Chandrababu Naidu was referred to more times than his father during the 60-minute speech of Prime Minister Narendra Modi. The change in choice of target is important to understand even as Naidu sits on a day-long fast in Delhi. Participating in the ‘Praja Chaitanya Sabha’ in Guntur in Andhra Pradesh, Modi in his aggressive speech said, “Though a sunrise state was promised (by Naidu), what is happening is actually the rise of the son,” clearly pointing to Lokesh. For those who listened to the speech, it came as a surprise that Modi preferred to address Naidu as “Lokesh ke papa”. So why is Lokesh, who has never contested an election and became a minister after being elected as MLC just two years back, being singled out by Modi? What will the topmost BJP leader in the country gain by attacking his political rival’s son? Modi has set the tone and for the next few months, the BJP will be gunning for Lokesh. “Lokesh is the de-facto chief minister of Andhra Pradesh. Whenever his father is not around, he is sitting in the CM’s chair,” said Buddha Chandrashekar, official BJP spokesperson of Andhra Pradesh. “Is it not clear from the prime minister’s speech that Lokesh is to be blamed for the current state of affairs of Andhra Pradesh? Lokesh is involved in a lot of scams including encroachment of land for ex-servicemen in Vizag. His scams are deep-rooted and this is just the tip of the iceberg. This man, who has never contested as MLA candidate, has been looting the state left, right and centre. The truth is Chandrababu is only a dummy chief minister who is protecting his son,” alleged Chandrashekar. The BJP is buoyed after Modi's public meeting as the prime minister reacted strongly and effectively for the first time against Naidu and TDP government. Modi's impassioned rhetoric was also a hit with the local BJP cadre. Nara Lokesh, who had completed his education in the US and worked for strengthening the TDP before he became a minister, is not new to corruption charges. Leaders of the opposition YSR Congress Party and Jana Sena have been criticising the political heir of Naidu for interference in governance. According to BJP leaders, attacking Naidu would give an impression that only he was at fault, but going after Lokesh would send out a message that there was “family misrule”. This way the credibility factor surrounding Naidu would be further damaged. The same evening, Naidu hit back at Modi, questioning his credentials as a “family man”. But will the TDP’s fight in Delhi, spending crores of rupees from state coffers, have any impact in state elections, scheduled to take place along with the general elections? Naidu organised a day-long ‘Dharma Porata Deeksha’ in Delhi on Monday to demand special category status to Andhra Pradesh, and the protest programme was attended by Congress president Rahul Gandhi and regional party leaders like Mulayam Singh Yadav and Farooq Abdullah who are expected to be part of the anti-BJP 'Mahagatbandhan'. So, who stands to gain and who will lose in the Modi-versus-Naidu fight? Rao noted the TDP government was facing serious allegations of corruption in the construction of capital Amravathi and the Polavaram project. “There are two options for the BJP now. The PM can directly order an inquiry or wait to take up the issue seriously after coming back to power,” Rao opined. According to Rao, the TDP’s fight against Modi would turn out to be a big “loss” for the party as the BJP had no base or foundation in Andhra Pradesh and the saffron party had nothing to lose even if it performed poorly in the state. “With this Delhi dharna, Chandrababu is trying to shift blame on Delhi for his failure. But people are not concerned about why you have failed. The only thing that matters for voters is whether you have failed or succeeded as a leader,” said Rao.